Captivating landscapes, a relaxed atmosphere, and heavenly cuisine: these are Portugal's most distinctive characteristics and three reasons to visit this mesmerising southern European country. Portugal's popularity as a must-see destination is growing among camping enthusiasts and lovers of the outdoors, as the country has everything you need for a blissful camping holiday filled with memorable experiences. The friendly team at LUX-camp can help you plan one of the best holiday experiences of your life, so get in touch for further information or to arrange your luxury camping trip in Portugal. Why should I camp in Portugal? Mild weather makes Portugal an ideal camping destination on and off season. A rich historical past evident in the country's delightful towns and cities. Portugal is a country marked by diverse and alluring natural beauty. No need to choose between a holiday by the sea or the mountains when you can have both! Luxury camping sites equipped with deluxe mobile homes and superb amenities in the country's most attractive holiday destinations. What can you expect from a camping holiday in Portugal? 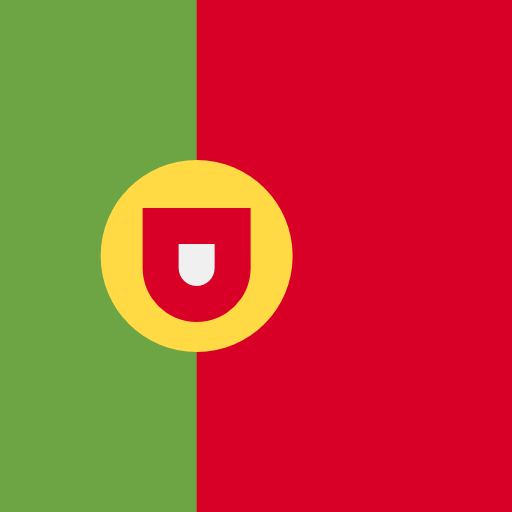 In short: diverse landscapes, modern comforts, and excellent infrastructure, along with daily opportunities for relaxation, to keep active, and to discover Portugal's unique character through its fine cuisine and interesting range of cultural events. Thanks to its stunning coastline, elegant architecture, and proximity to Lisbon and to the lush Sintra mountains, the Cascais region is the ideal base for a camping holiday. It is for a good reason that Cascais was the seaside getaway of royals for nearly 100 years! Camp along the Cascais coast to find the perfect balance between relaxation, cultural activities, and a vibrant nightlife. The Algarve region is renowned for its spectacular coastal scenery, its serene environment, and its slow pace of life. 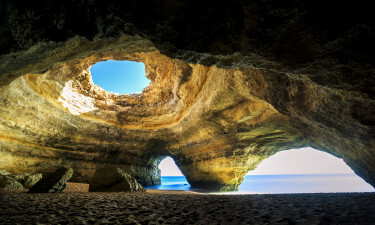 This means that Algarve is perfectly suited to any luxury camping trip. Camp in this region and explore its traditional fishing villages, remote sandy beaches, dramatic cliffs, beautiful islands, and rugged interior. You won't be disappointed. 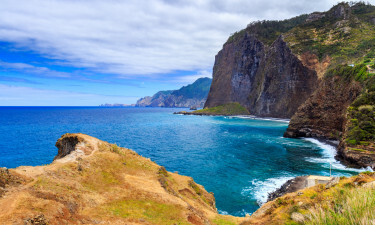 Portugal boasts more than 1,000 miles of glorious coastline. The country's beaches range from the remote and windswept beaches near Porto (such as Praia do Cabedelo) to the sun-drenched beaches near Lagos, Faro, and Albufeira, which are surrounded by some striking scenery. Further inland, Portugal's countryside is as breathtaking as the coastline. Extinct volcanoes, impressive waterfalls, wooded hills, and magnificent mountains are some of Portugal's top highlights. Portugal's best-rated attractions and activities include Lisbon's Alfama neighbourhood (great place to catch a live fado performance), the National Palace in Sintra, the medieval town of Coimbra, taking a train ride along the Douro Valley (a UNESCO site and a major wine-growing region), golfing in Algarve, watching dolphins in the Troia peninsula, and going on one of the many wine routes available. The local gastronomy is simply heavenly, appealing especially to those who like fish or seafood fishes. 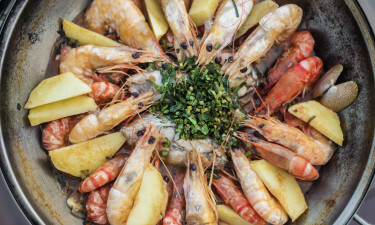 Some of Portugal's top culinary delights include bacaulhau (cod dishes that can be grilled, roasted, or served in a casserole), caldeirada (fish soup), and feijoada (a tasty beef stew). Portugal's world-famous wines are not just limited to its stunning variety of port. The fruity and slightly citrussy vinho verde wines are the perfect companion to a seafood meal, whereas the local Douro wines are just as rich and flavourful as the best Riojas. Not sure where to start? Gain some insight into the local wine culture by visiting one of the many wine festivals that take place all over the country in September. Portugal's weather is generally mild, although rainy weather is more common in the north, where average temperatures are also lower than in the rest of the country. Central and southern Portugal are characterised by their bright and sunny skies pretty much all year round, with the exception of the winter months. The only exception is the Algarve region, where sunshine is virtually guaranteed from January to December. Once a major world power, Portugal now keeps a low profile that is part of its charm. 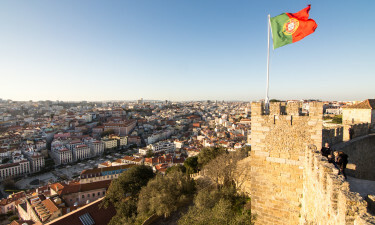 Over the course of several centuries, Portugal has been inhabited by Celtic tribes, Romans, Moors, and Visigoths, all of whom left a historical legacy in the form of monuments, palaces, colonial buildings, ancient temples, and medieval towns.